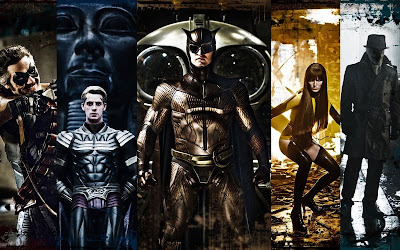 Sure there were some parts that didn't work for me, the almost cheesy love scene between Silk Spectre (Malin Akerman) and Nite Owl (Patrick Wilson), and the Adrian Veidt/Ozymandias (Matthew Goode) character whose portrayal was very flat and uninteresting in most of the film. But over all, Watchmen was mindblowing. I left the movie theater mildly disturbed by the ending w/c begs the question, how far should we go to achieve world peace? So it's definitely not your ordinary superhero movie. Which is why I loved it. And why I needed a stiff drink after. There are no big name actors in this movie which is fortunate because they don't distract from the real celebrity here w/c is the story itself. My favorite character is the sinister Rorscach/Walter Kovacs (played by Jackie Earle Haley, remember Bad News Bears?) who plays narrator in the film and is the one who pushes on to investigate The Comedian's death. He wears a mask with an ever-changing inkblot, very cool. But his character is so menacing and depressing, you wonder how he ever became a super hero. Before I spill the beans on the rest of the film, just go watch it and be open to the entire experience. I'm ready for my second turn at Watchmen. And yeah, I am buying the book. Re: Off tangent. Jeffrey Dean Morgan's character in Supernatural, as father to both Dean and Sam Winchester also died after more than a handful of episodes. Haha. Hay. Oh and yes, Watchmen rocks. Also on Supernatural?!?! Gads, ang malas naman nya! He really should fire his manager, haha.